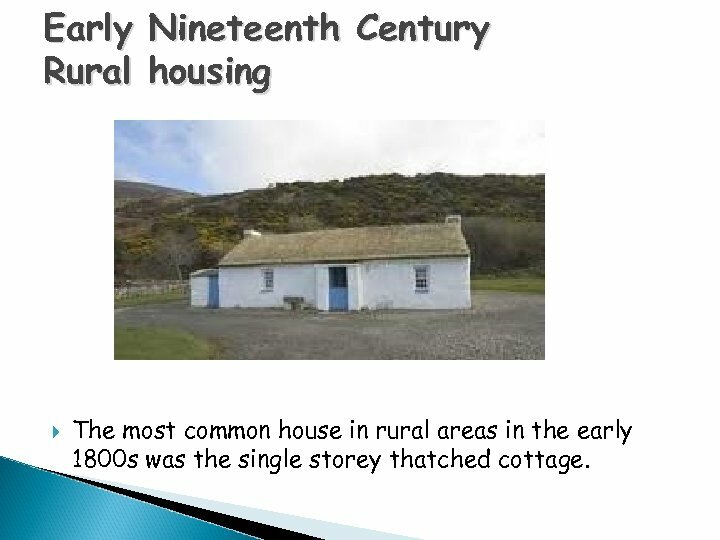 Early Rural Nineteenth Century housing The most common house in rural areas in the early 1800 s was the single storey thatched cottage. 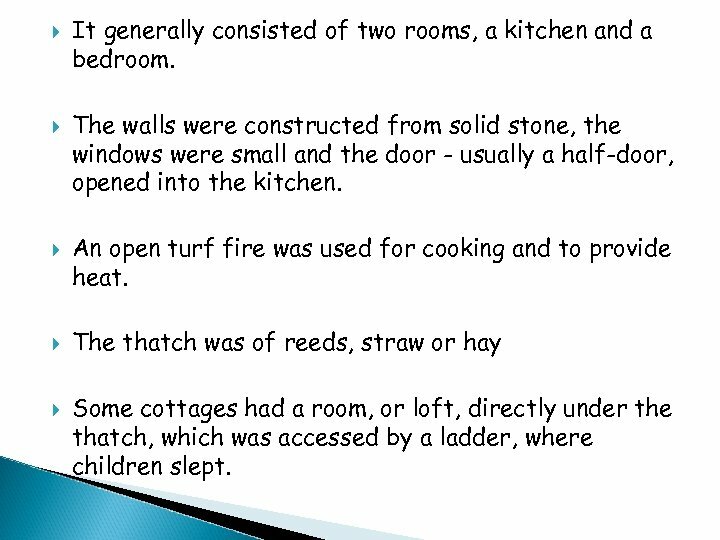 It generally consisted of two rooms, a kitchen and a bedroom. The walls were constructed from solid stone, the windows were small and the door - usually a half-door, opened into the kitchen. An open turf fire was used for cooking and to provide heat. The thatch was of reeds, straw or hay Some cottages had a room, or loft, directly under the thatch, which was accessed by a ladder, where children slept. 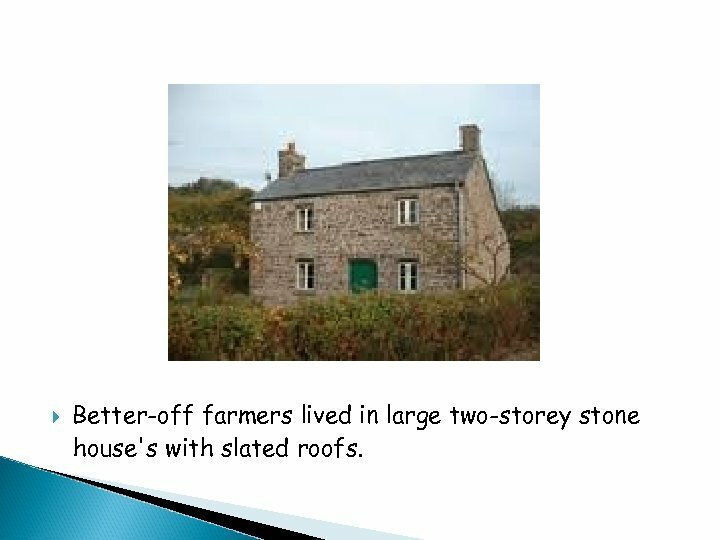 Better-off farmers lived in large two-storey stone house's with slated roofs. 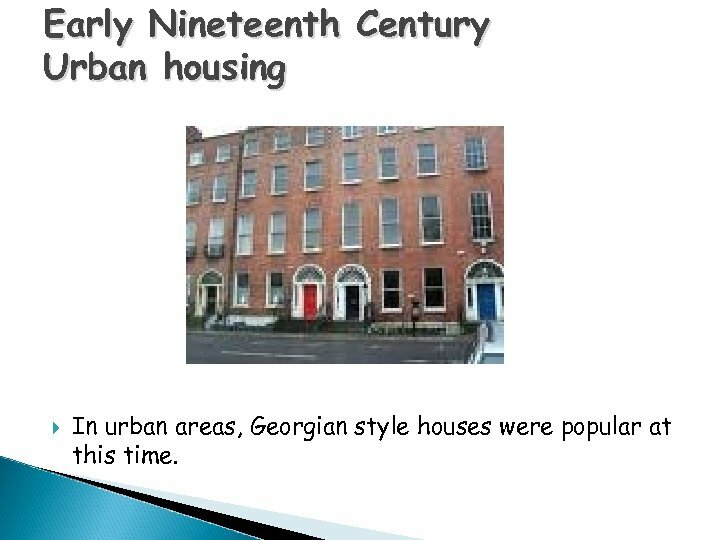 Early Nineteenth Century Urban housing In urban areas, Georgian style houses were popular at this time. 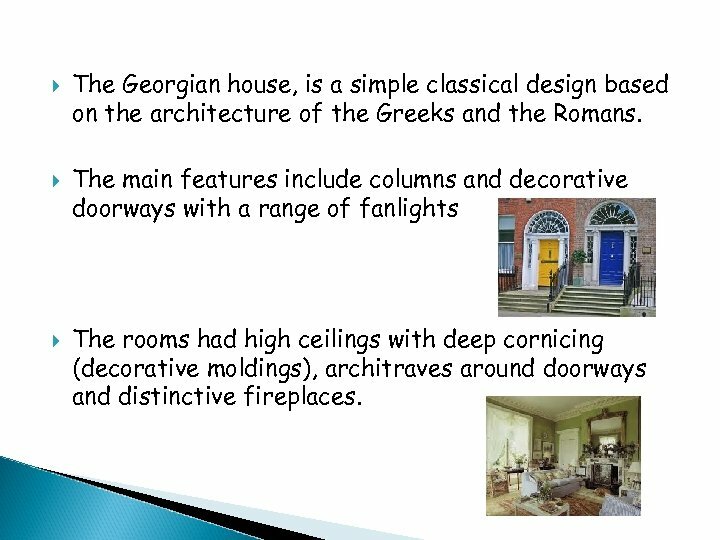 The Georgian house, is a simple classical design based on the architecture of the Greeks and the Romans. The main features include columns and decorative doorways with a range of fanlights The rooms had high ceilings with deep cornicing (decorative moldings), architraves around doorways and distinctive fireplaces. 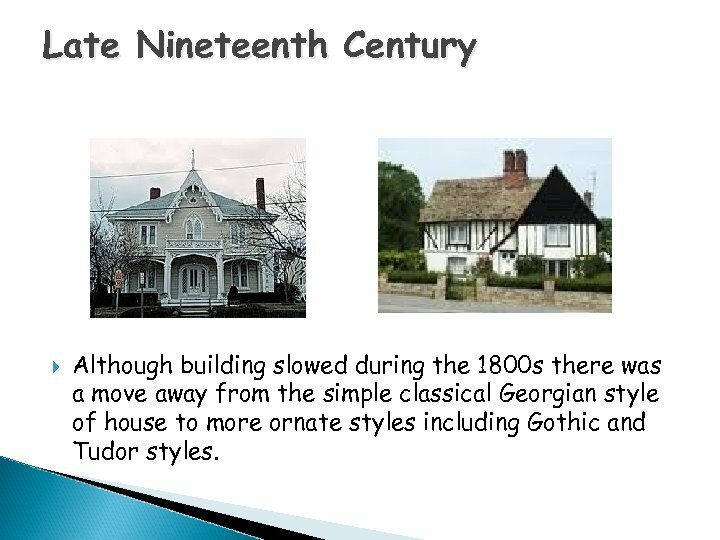 Late Nineteenth Century Although building slowed during the 1800 s there was a move away from the simple classical Georgian style of house to more ornate styles including Gothic and Tudor styles. 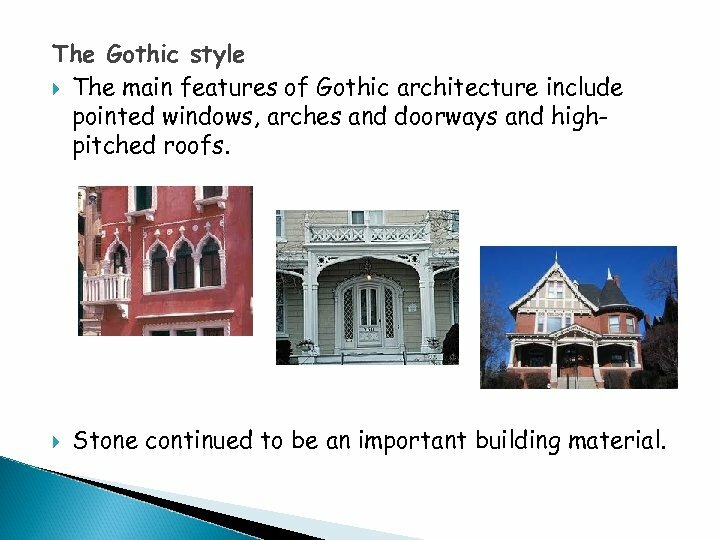 The Gothic style The main features of Gothic architecture include pointed windows, arches and doorways and highpitched roofs. 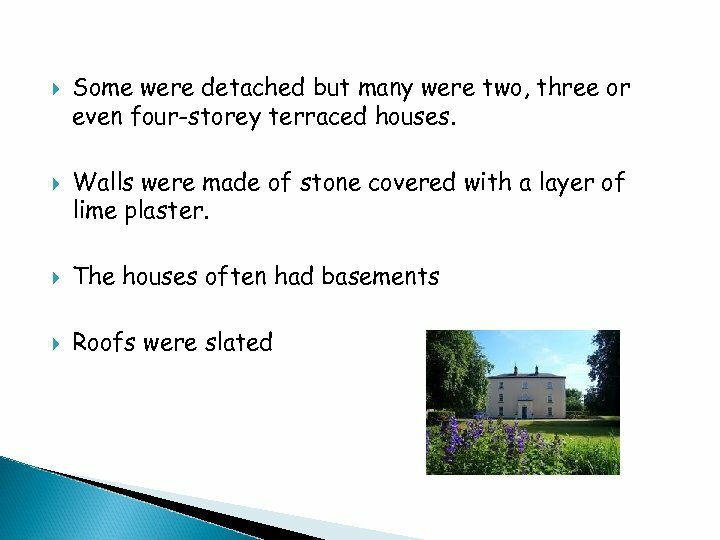 Stone continued to be an important building material. 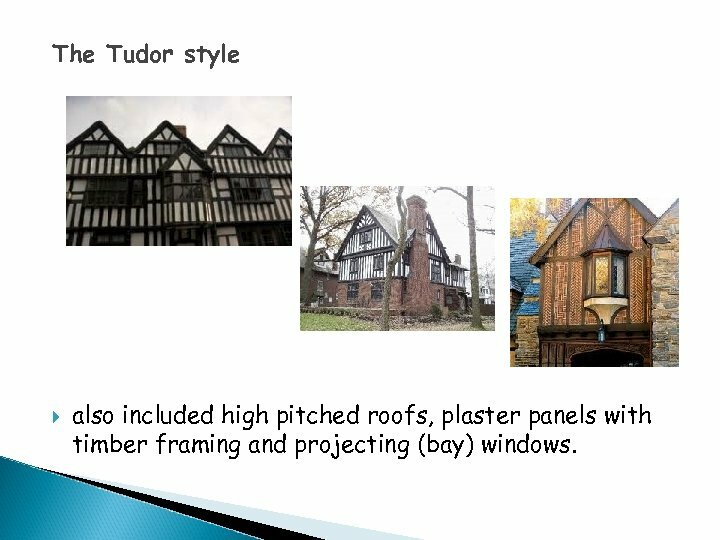 The Tudor style also included high pitched roofs, plaster panels with timber framing and projecting (bay) windows. 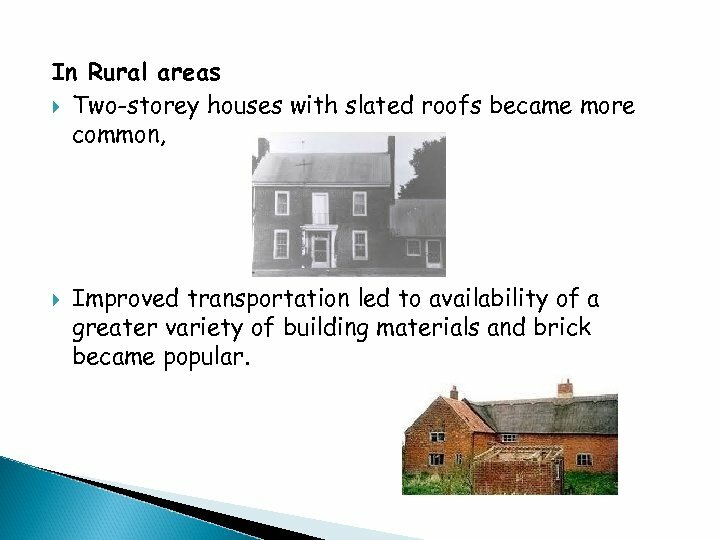 In Rural areas Two-storey houses with slated roofs became more common, Improved transportation led to availability of a greater variety of building materials and brick became popular. 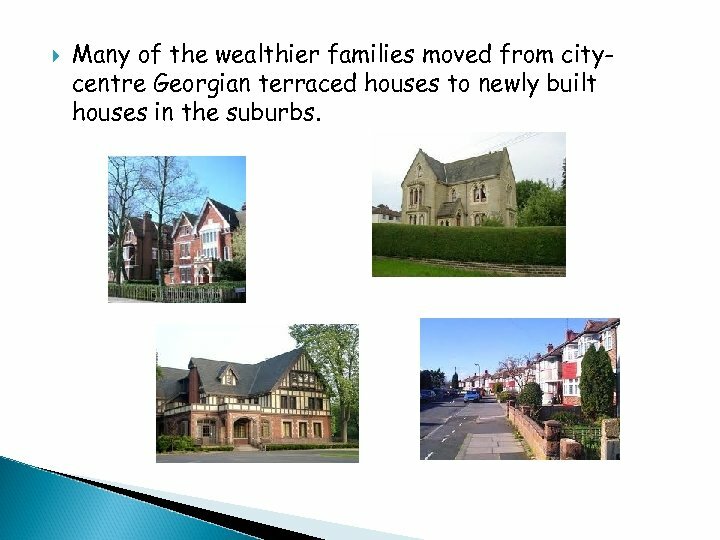 Many of the wealthier families moved from citycentre Georgian terraced houses to newly built houses in the suburbs. 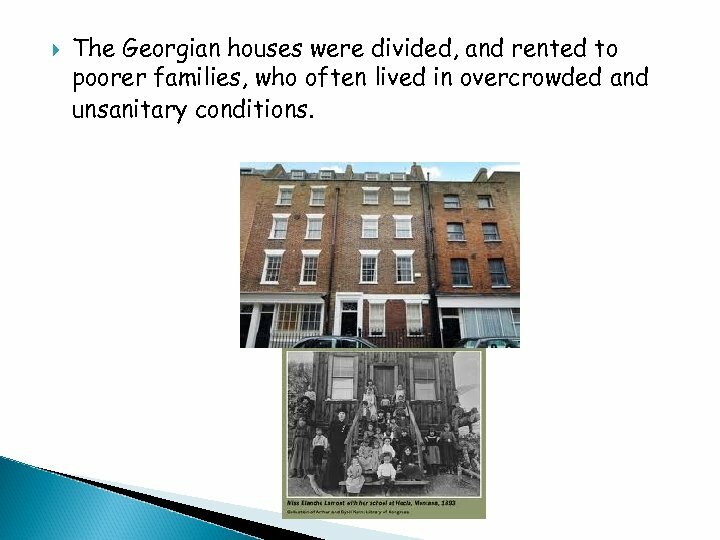 The Georgian houses were divided, and rented to poorer families, who often lived in overcrowded and unsanitary conditions. 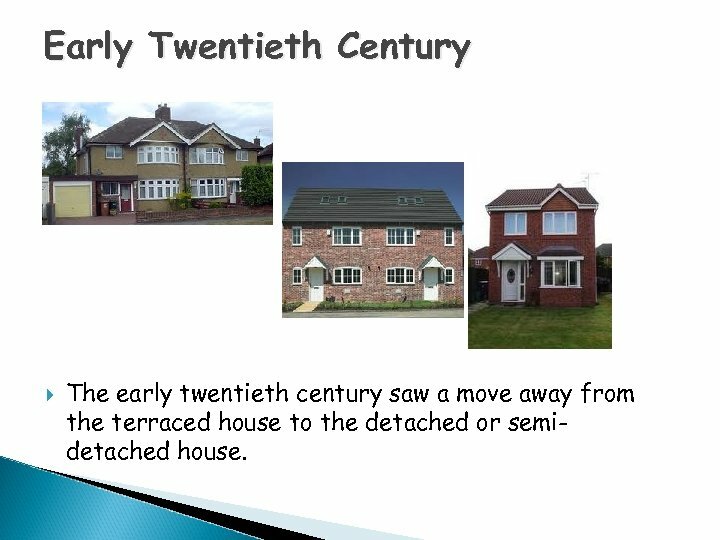 Early Twentieth Century The early twentieth century saw a move away from the terraced house to the detached or semidetached house. 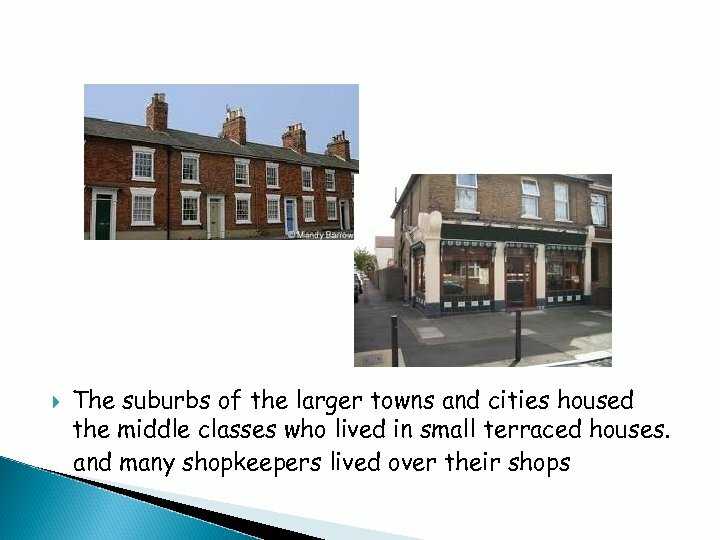 Council and housing estates were built on the outskirts of towns and cities. 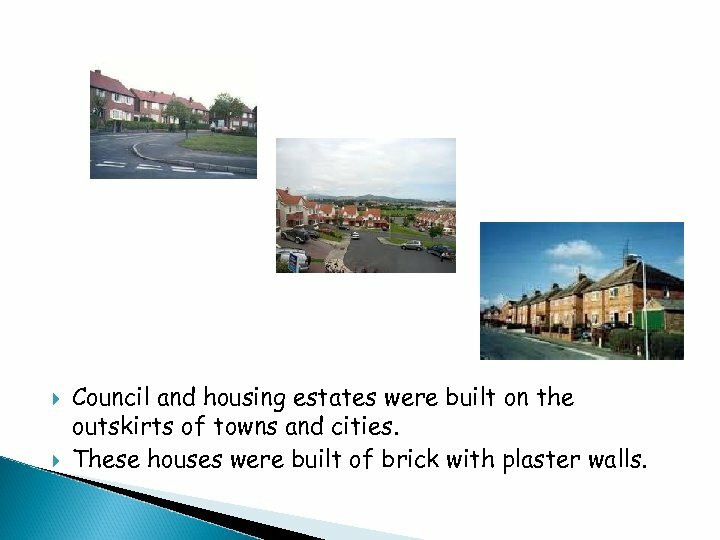 These houses were built of brick with plaster walls. 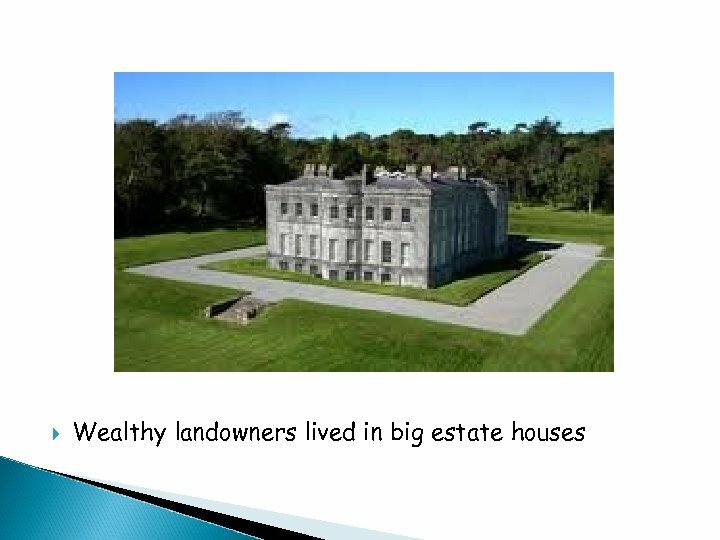 As land became more expensive, the houses were usually two-storey’s high. 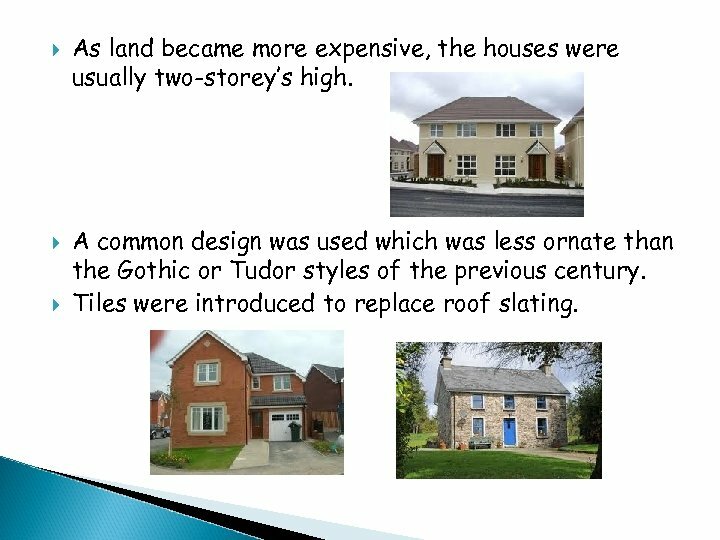 A common design was used which was less ornate than the Gothic or Tudor styles of the previous century. Tiles were introduced to replace roof slating. 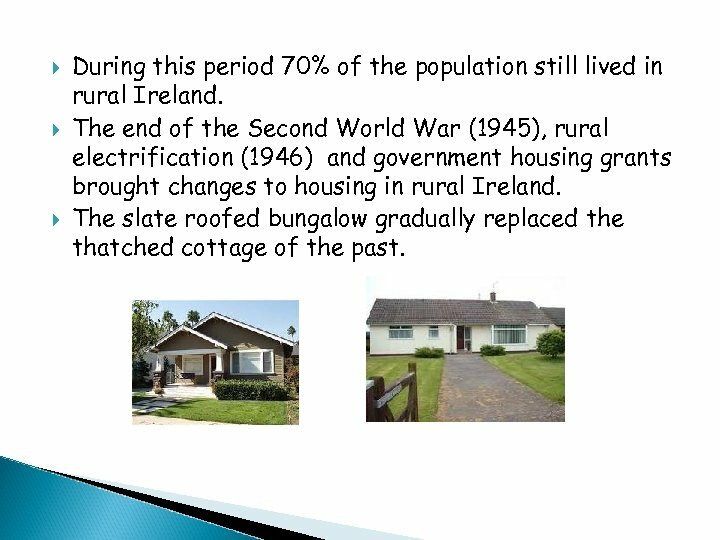 During this period 70% of the population still lived in rural Ireland. 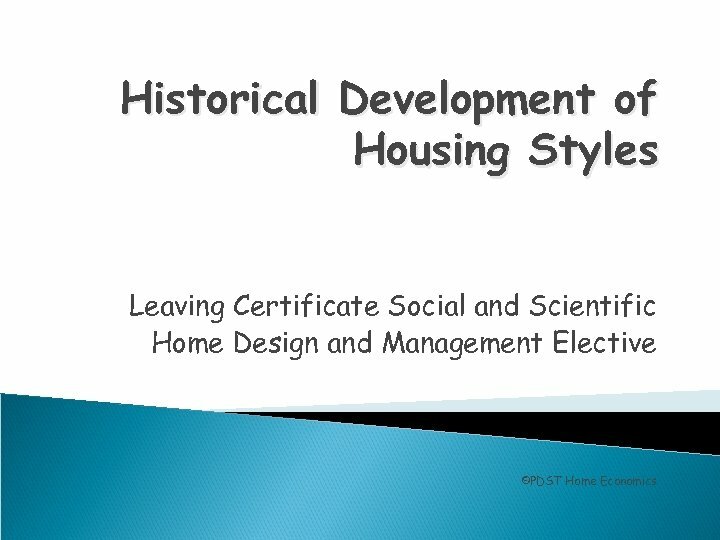 The end of the Second World War (1945), rural electrification (1946) and government housing grants brought changes to housing in rural Ireland. The slate roofed bungalow gradually replaced the thatched cottage of the past. 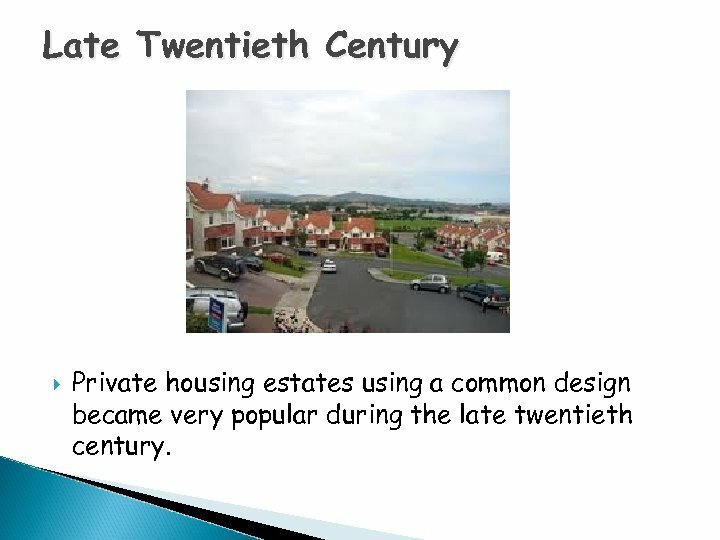 Late Twentieth Century Private housing estates using a common design became very popular during the late twentieth century. 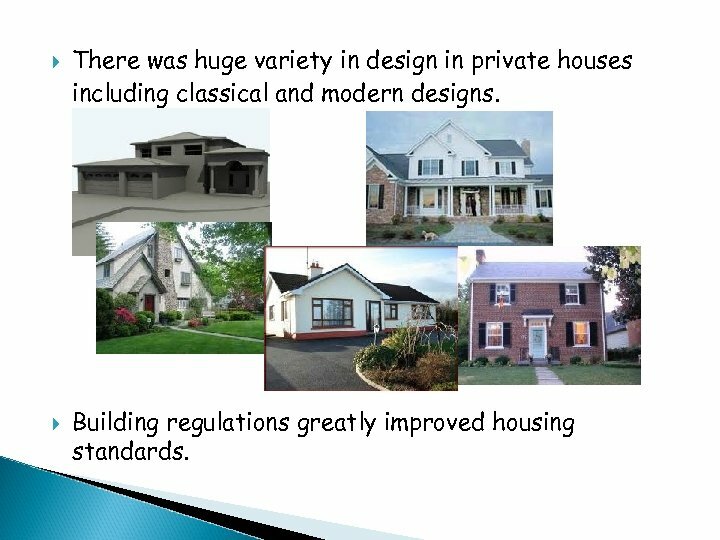 There was huge variety in design in private houses including classical and modern designs. 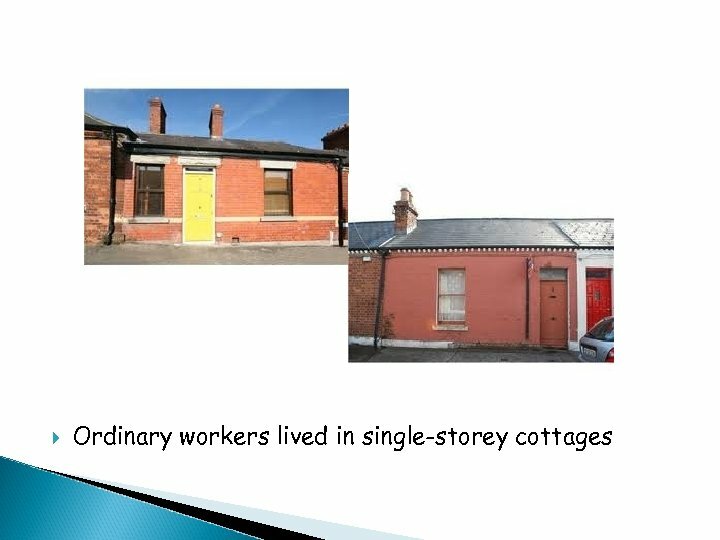 Building regulations greatly improved housing standards. 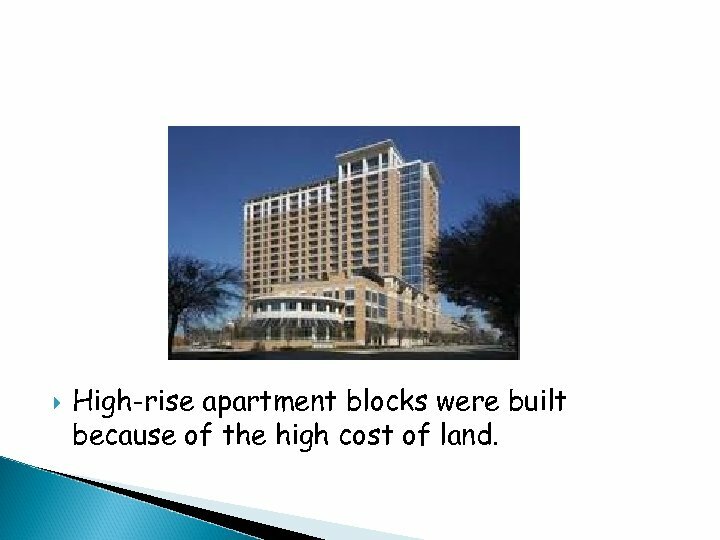 High-rise apartment blocks were built because of the high cost of land. 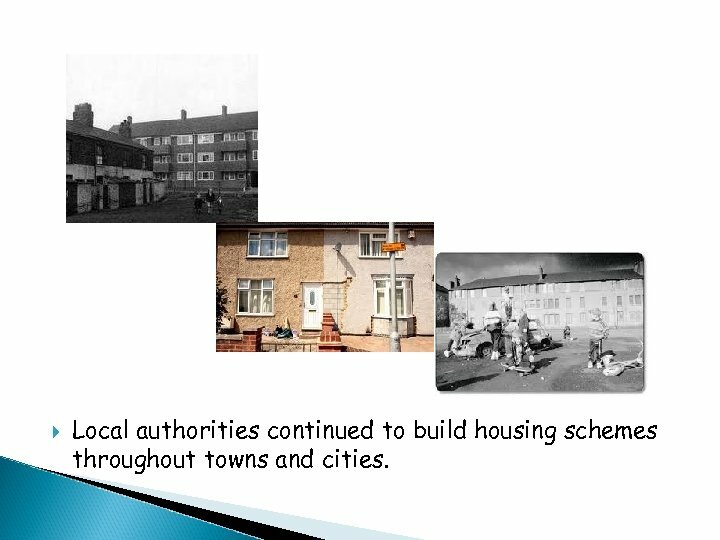 Local authorities continued to build housing schemes throughout towns and cities. 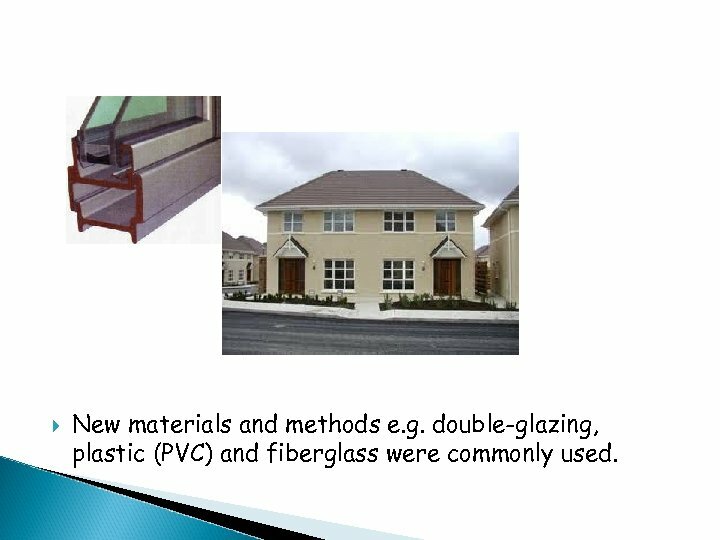 New materials and methods e. g. double-glazing, plastic (PVC) and fiberglass were commonly used. 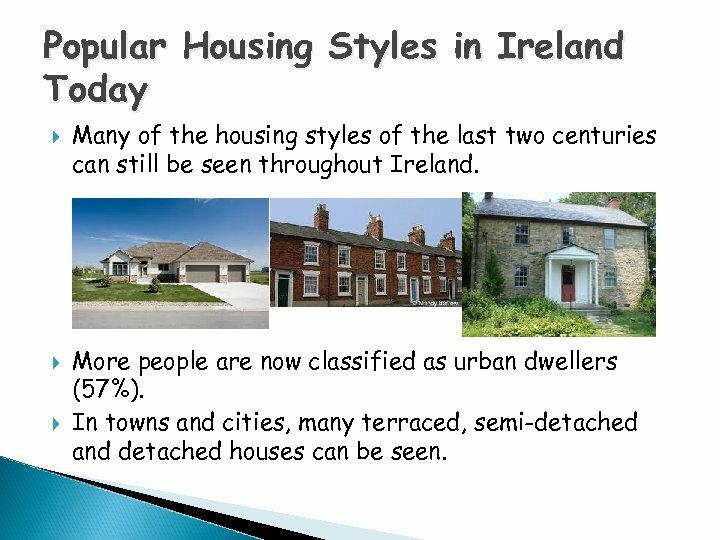 Popular Housing Styles in Ireland Today Many of the housing styles of the last two centuries can still be seen throughout Ireland. More people are now classified as urban dwellers (57%). 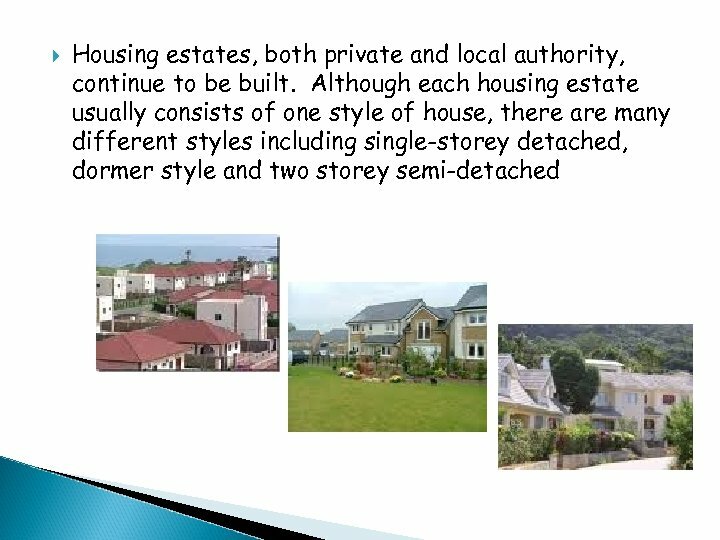 In towns and cities, many terraced, semi-detached and detached houses can be seen. 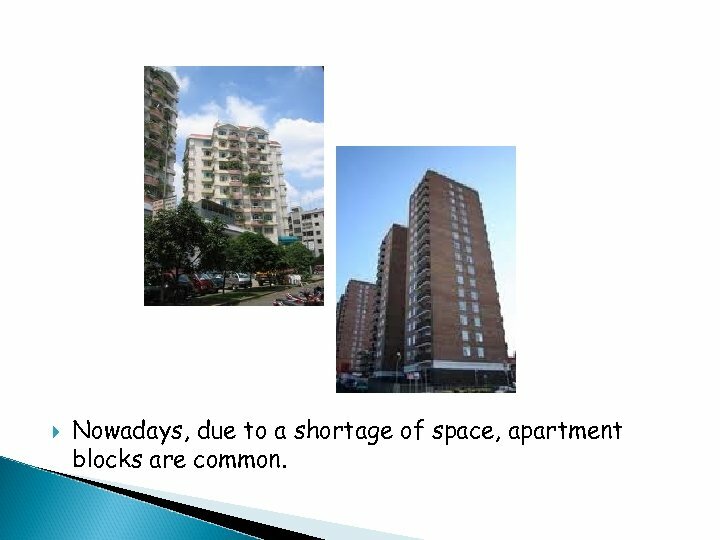 Nowadays, due to a shortage of space, apartment blocks are common. 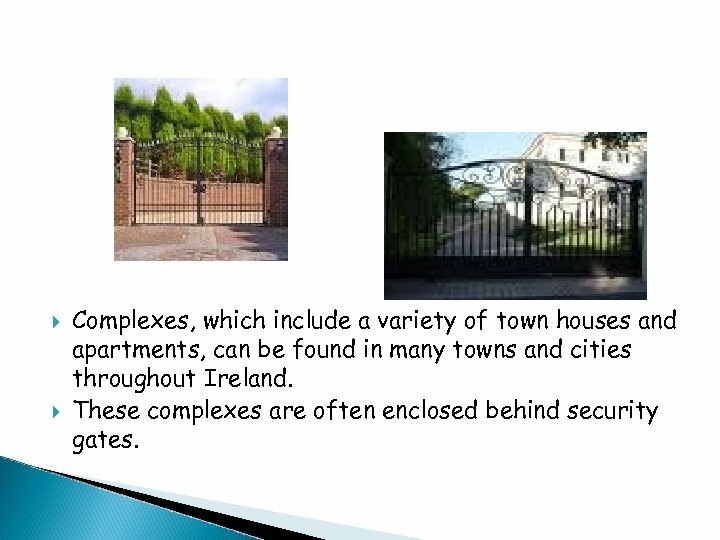 Complexes, which include a variety of town houses and apartments, can be found in many towns and cities throughout Ireland. These complexes are often enclosed behind security gates. 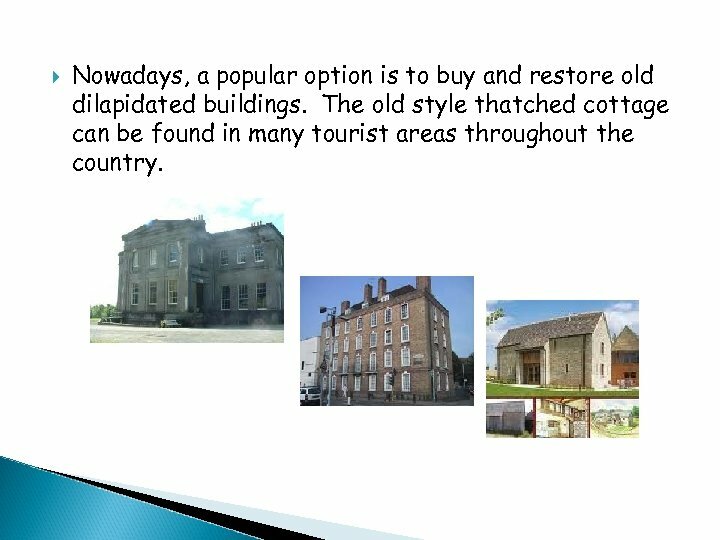 Nowadays, a popular option is to buy and restore old dilapidated buildings. The old style thatched cottage can be found in many tourist areas throughout the country. 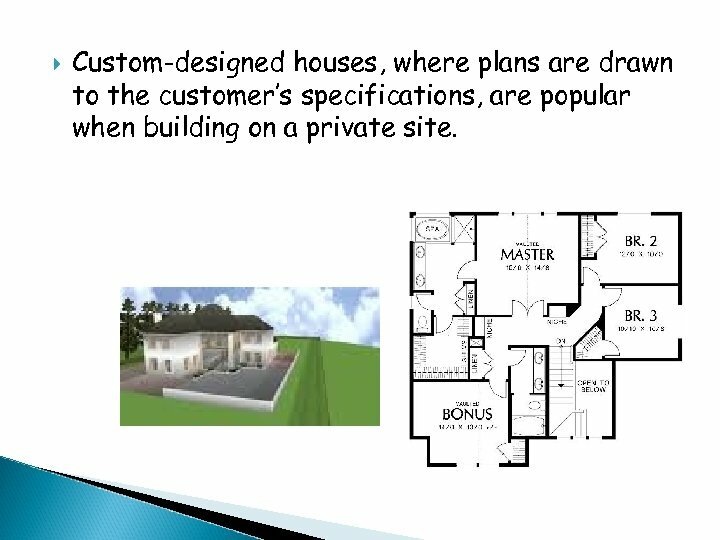 Custom-designed houses, where plans are drawn to the customer’s specifications, are popular when building on a private site. A popular method of extending space within houses is to convert attic space and install Velux windows. 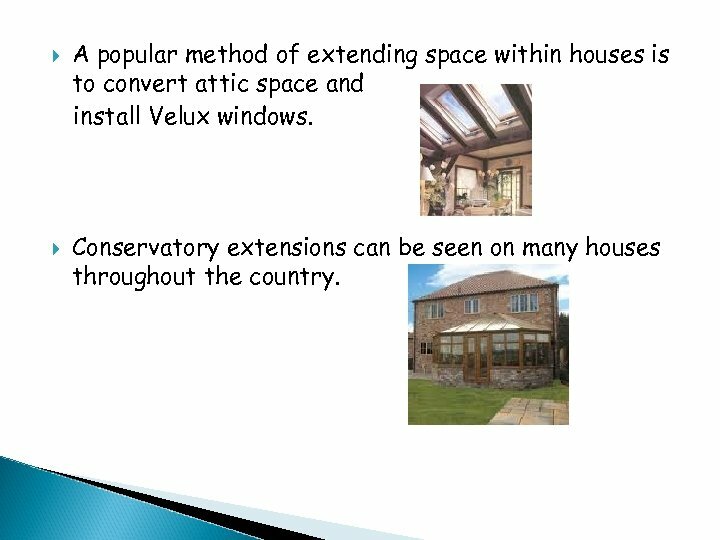 Conservatory extensions can be seen on many houses throughout the country. 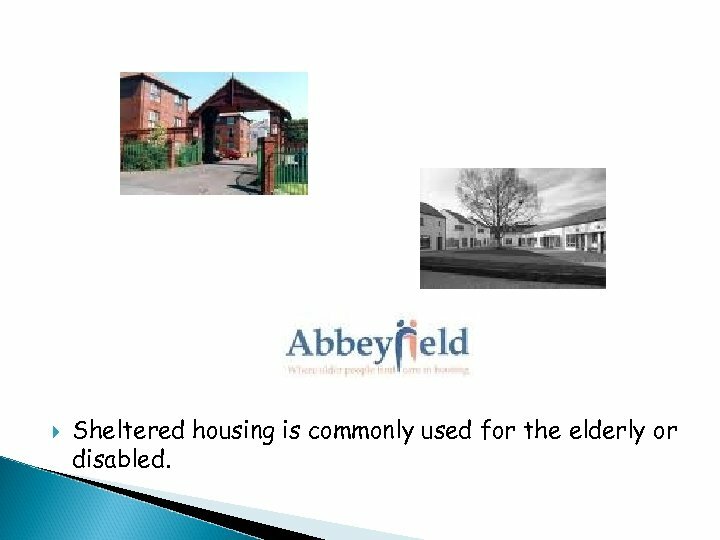 Sheltered housing is commonly used for the elderly or disabled.